243 grey injected moulded parts (72 not used), 17 clear parets (8 not used), 32 photoetched parts, masks, decals and comprehensive instructions. Crisp yet subtle moulding with superb detail, Eduard’s usual high quality instructions. 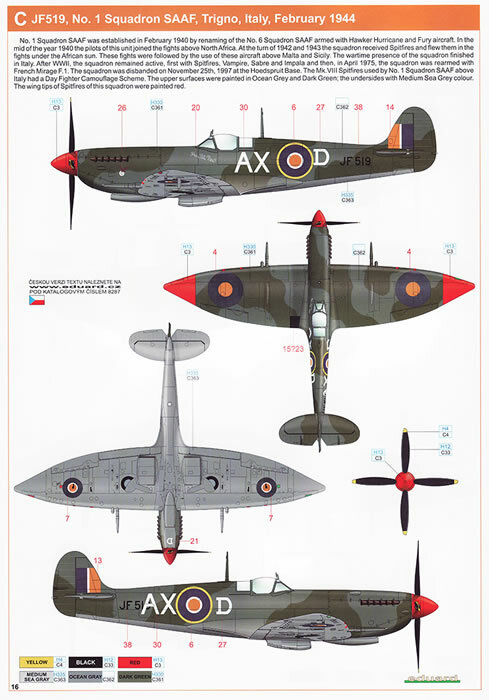 A nice choice of schemes and Spitfire VIII versions. The only drawback of this kit is the 2 piece cowl cover which makes it difficult to keep the required details after joining. 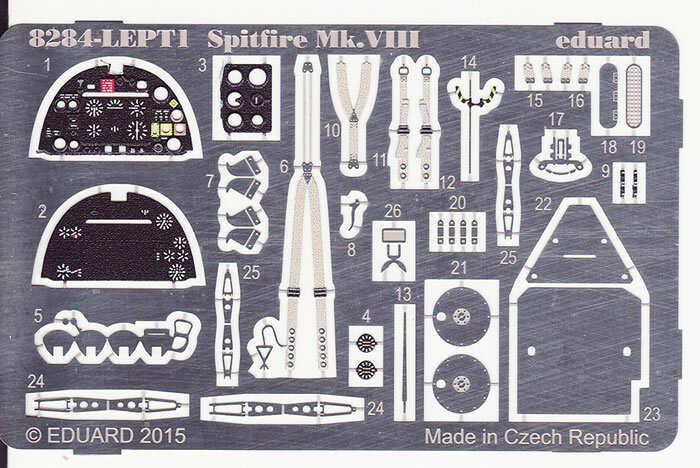 This is a great kit of the Spitfire HF VIII from Eduard with everything included to make a highly detailed model with some different schemes for Spitfires. 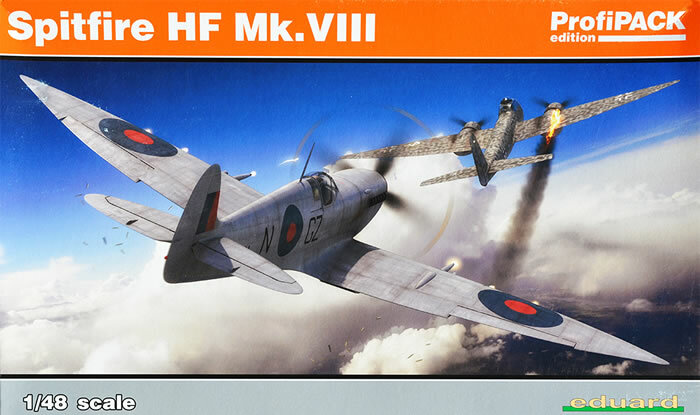 I have previously written a longer historical piece on the Mk VIII Spitfires a few weeks ago in the 1/72 review. Briefly, the Mk VIII (and VII) featured a strengthened fuselage with a retractable tail wheel. 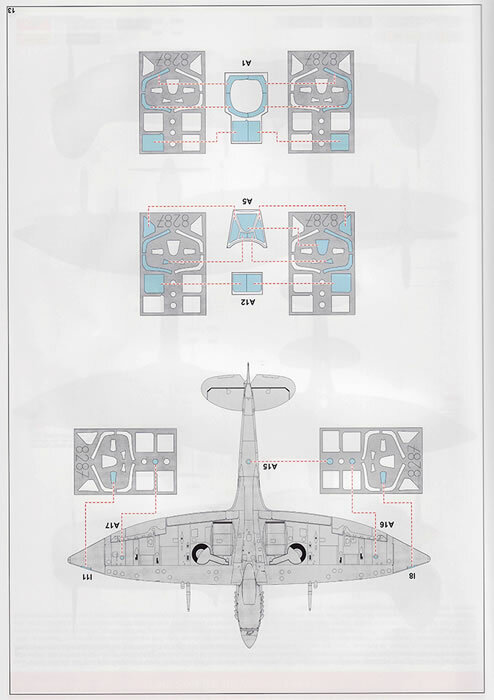 Each wing carried a 14-gallon self-sealing fuel tank, and the main fuselage fuel tank was increased in size to 96 gallons. These changes gave the Mk VIII the same range as the Mk V, although as this distance was achieved at a higher speed, the Mk VIII could stay in the air for less time than the Mk V. Most Mk VIIIs used a new broad-chord, or pointed-tip rudder. It also featured a new tropical filter – the Vokes Aero-Vee – that was so well designed it was installed on all Mk VIIIs and adapted for the Mk IX. The Mk VIII used the “c” wing armament (four cannon or two cannon and two machine guns) and could carry up to 1,000lbs of bombs. 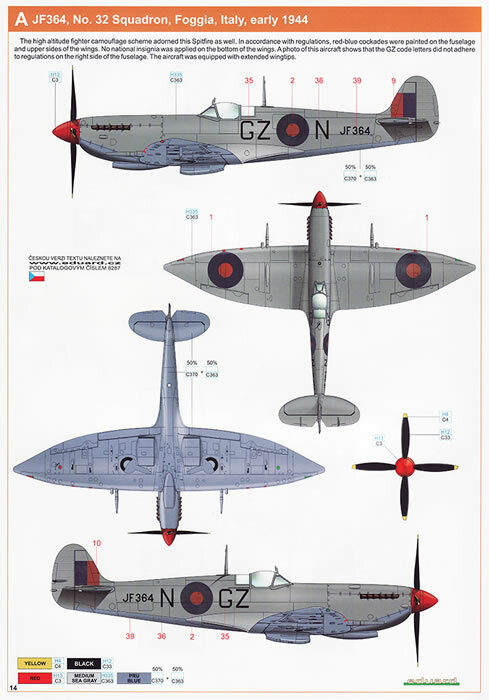 1,657 Mk VIIIs were produced in all, so although it never replaced the Mk IX in Britain and Northern Europe it was still a major version of the Spitfire. It was produced in three versions. 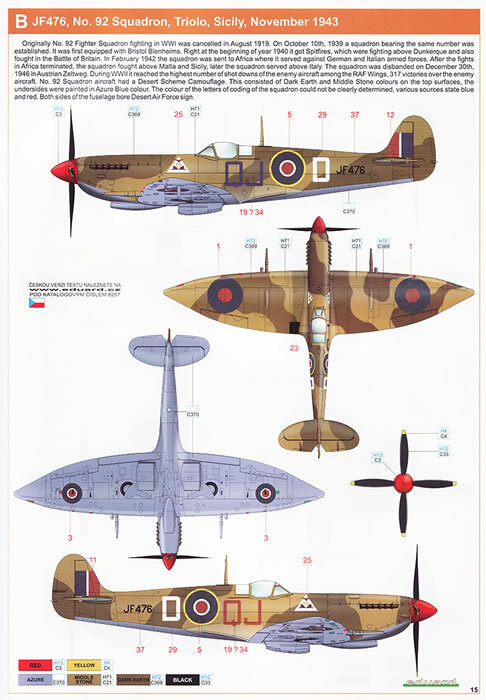 The F.VIII using the 1,560 hp Merlin 61 was the standard fighter model. 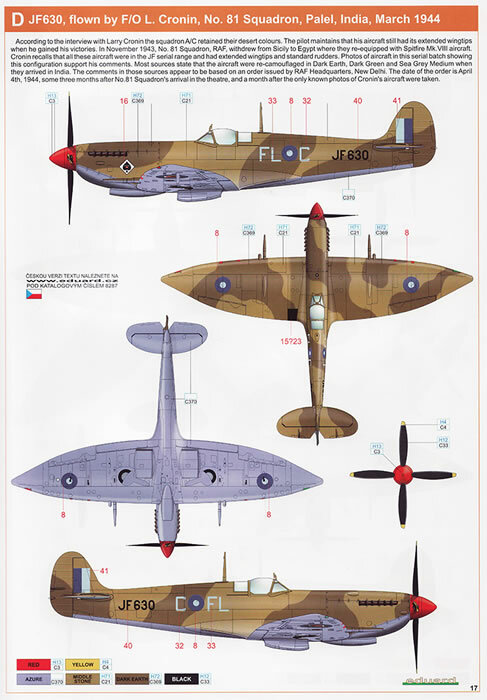 The HF.VIII used a 1,655hp Merlin 70 and was a high altitude fighter and the LF.VIII used the 1,705 hp Merlin 66 and was officially a low altitude fighter, although its best altitude was not that much lower than for the F. The F Mk VIII's top speed was 408 mph (657 km/h) at 25,000 ft ,404 mph for the LF Mk VIII at 21,000 ft and 416 mph for the HF Mk VIII at 26,500 ft, with a service ceiling of 43,000 ft, 41,500 ft for the LF Mk VIII and 44,000 ft for the HF Mk VIII. 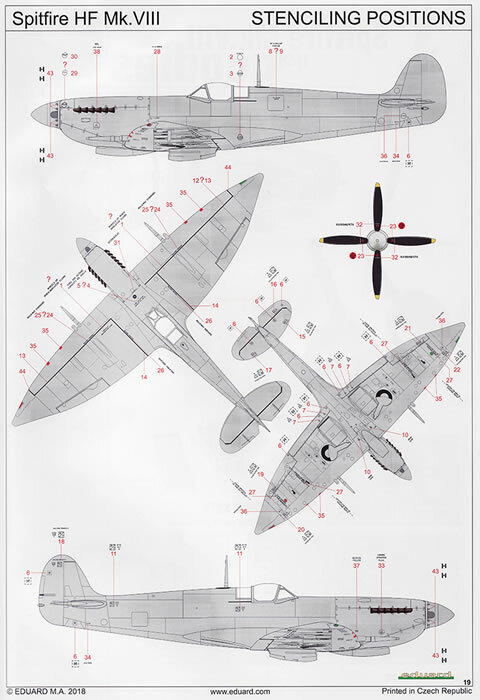 The sturdy Eduard box is packed full of all the goodies you will need to make a really nicely detailed model of this Spitfire. The contents include, 4 grey injected moulded sprues with some 243 parts on them. Upon careful examination of the instructions I find that 72 of these parts are not to be used in this version, so the spares box will have plenty added to it. 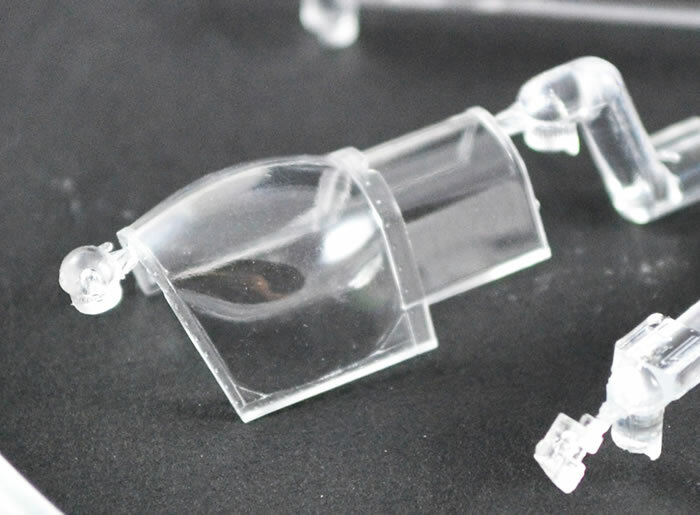 There is one clear sprue containing 17 very clear parts with 8 not used, a sheet of photoetch containing 32 parts, a sheet of masks and the usual comprehensive instruction booklet. 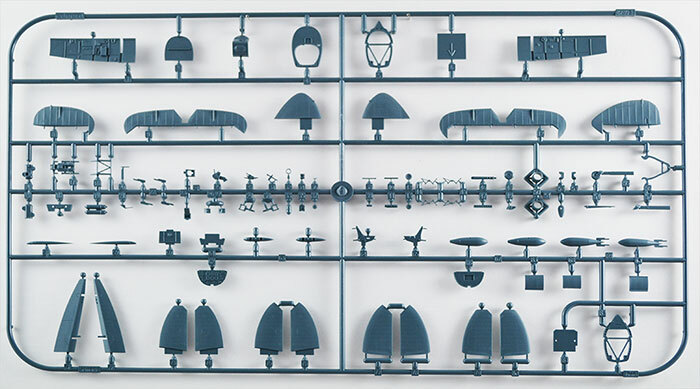 All sprues are cleanly moulded with no flash evident and sprue gates to the parts appear to have been created to minimise their effect on the parts. 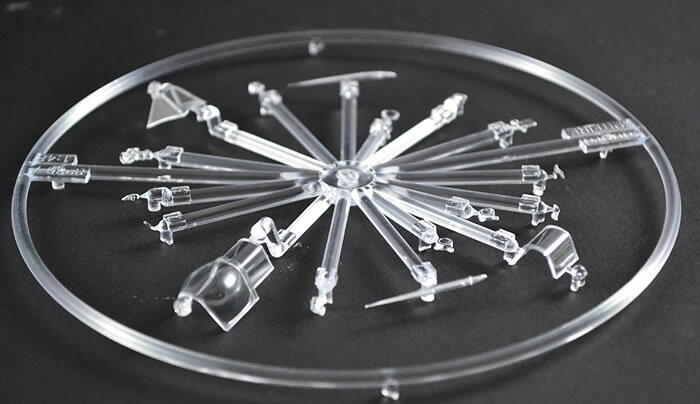 This sprue is the clear sprue and has 17 parts on it, with 8 of these not used for this model. I believe many of these are relevant for the Mk IX version. You only get the choice of the 3 parts canopy. There are plenty of lights to give a realistic finish to your model rather than the old painted method. 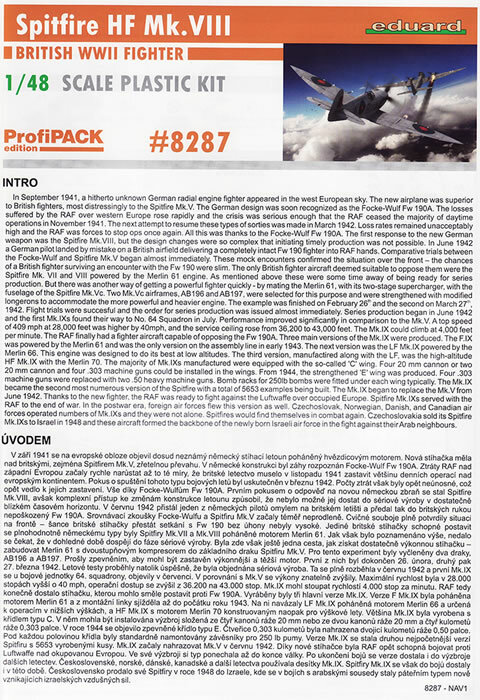 Sprue B contains 98 parts (38 not used). There are 2 types of tail planes but only one used for the HF version, the majority of the cockpit parts including a choice of instrument panels, raised detail or just a flat on to be used with the coloured etched instrument panel. 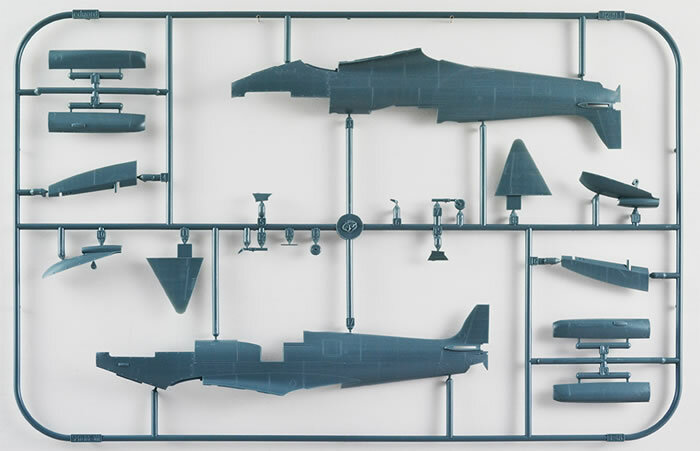 This sprue also offers a choice of the cockpit door in open or closed modes, which is very useful. 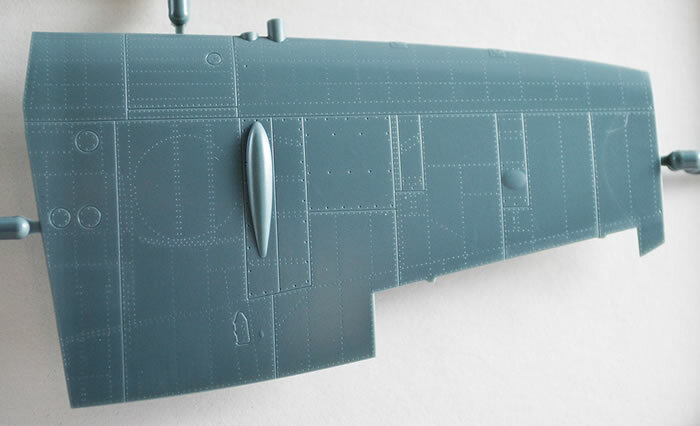 The full choice of all 3 wing tip versions are on this sprue but you only use the extended wing tips for this model. You also have both rudder versions given to you, both rounded and the pointed versions, but all HF VIII’s were the rounded rudder, so straight off to the spares box. Only 3 parts, the upper wings and the full lower wing. Detail is excellent on all surfaces. This large sprue has 97 parts on it, with 32 of these unharmed in making the HF version. I must say, between this sprue and sprue F, 70 parts get added to the spares box, which seems a large number. 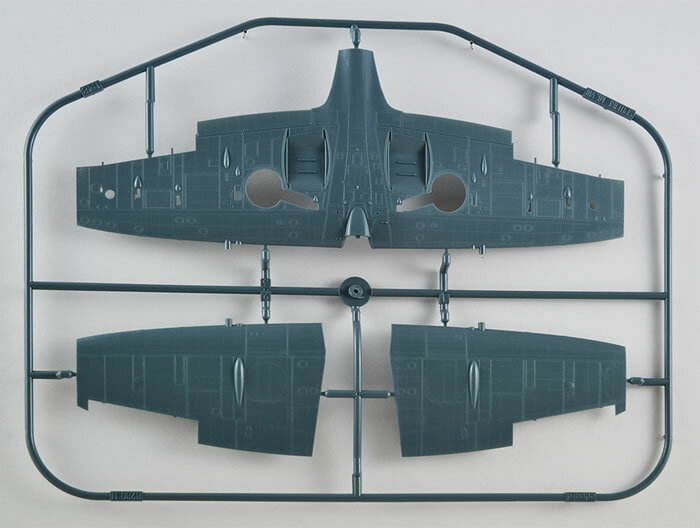 This sprue delivers us the undercarriage components, including separate wheels and hubs, 2 sets of exhausts with hollowed ends which are nearly as good as resin ones, the prop and canon barrels plus many other smaller detail parts. 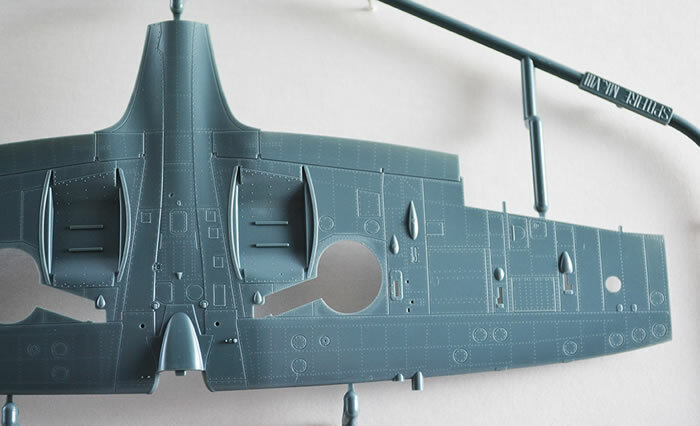 Finally we get to the sprue having the fuselage halves, exhibiting refined detail, both recessed and raised as is necessary. Rivets are fine and restrained and easily could disappear under a heavier coat of paint. One poor thing noted and, to me (and many other fellow modellers I know of) totally un-necessary, is the way Eduard insists on doing the top engine cowl as a 2 piece construction. I do know from constructing other 1/48th versions that an aftermarket replacement one piece cowl is a most desirable addition to any of the Spitfire kits and this one is no different. 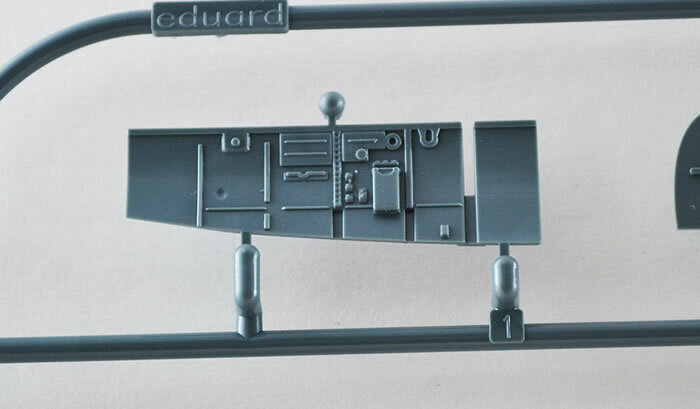 The extended wing tips and short ailerons are on this sprue. 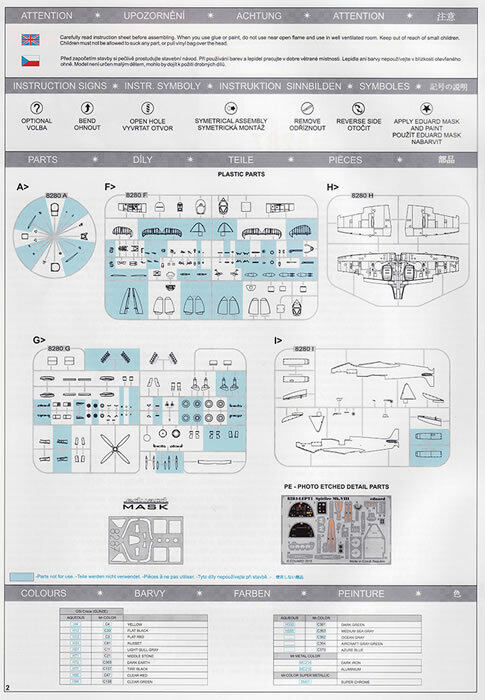 A very nice photoetch sheet of 32 parts is included in the Profipack which includes pre-coloured seat belts and instrument panel. 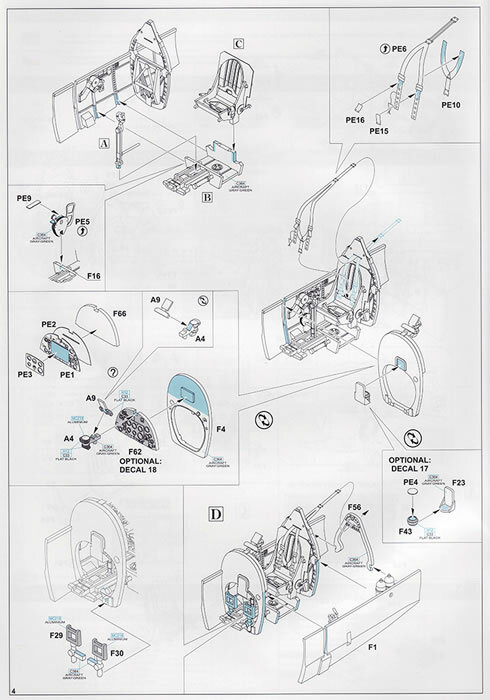 There are many parts, such as the carburettor facings, as well small additions to the cockpit. A sheet of typical Eduard tape style masks completes the kit. These allow for masking of both open and closed canopies as well as masking for the wingtip, underwing and fuselage light. This is a very useful inclusion. The instructions for the kit are the usual Eduard, high quality detailed instructions, with copious colour call outs throughout, using the Gunze Aqueous and Mr Color range. 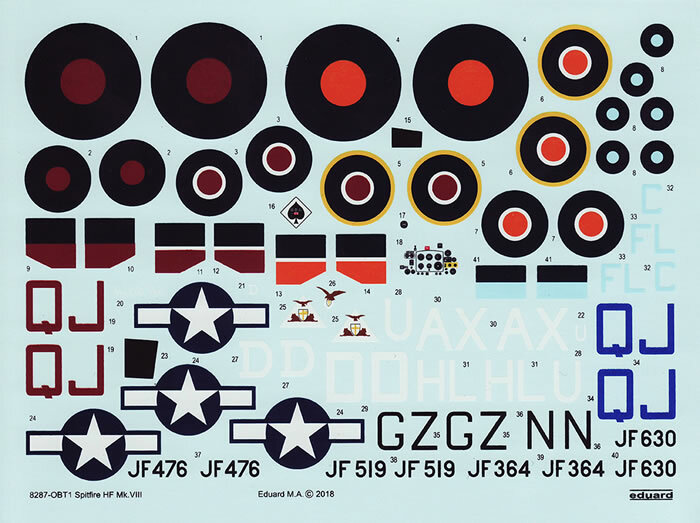 The decals appear to be in perfect register giving the options for 6 different aircraft. 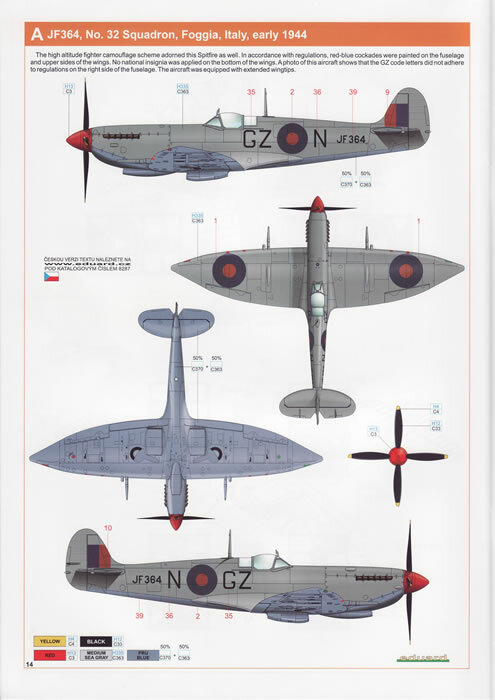 One comment to the negative on the instructions is that the opening front piece of historical introduction refers continually to the Spitfire Mk IX. 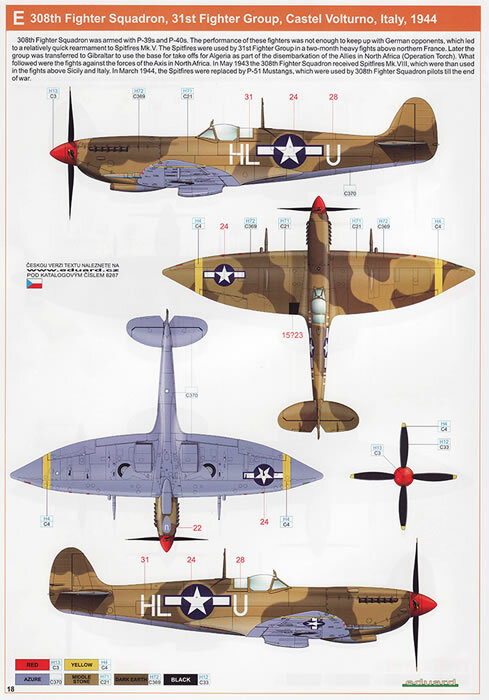 Individual references are to Mk VIII engines etc but still talking about the Mk IX. I’m not sure whether this is just a typo (many times) or they converted Mk IX blurb and it was poorly edited. Not up to Eduard’s usually high standard. This is a very nice, well detailed kit. 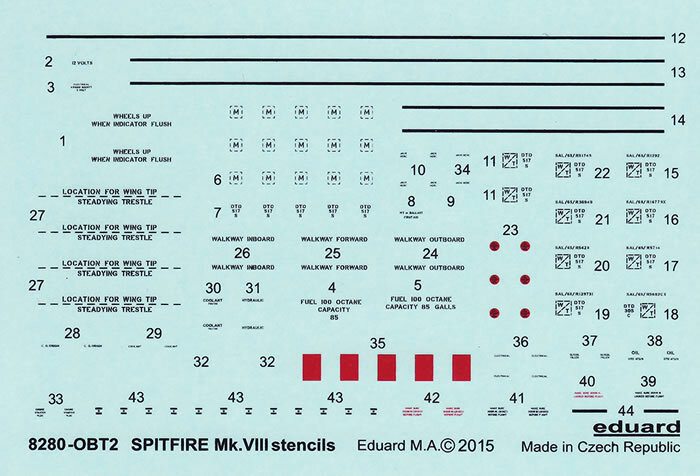 The Eduard Spitfire Mk VIII kit ticks all the right boxes: a great choice of schemes covering the Mediterranean and Indian theatre of operations. It’s nice to have a Mk VIII in a desert scheme to have a go at!